InvestorsObserver Stock Reports and Options Reports consider technical and fundamental factors. InvestorsObserver’s Reports provide clear, easy-to-understand stock scores or options trade ideas that don't leave you swimming in a sea of numbers. 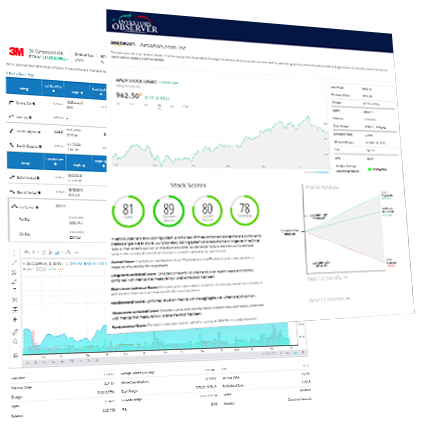 Stock Reports: Combines technical and fundamental analysis to score stocks. Options Trade Ideas: Includes • Covered Calls • Cash Covered Puts • Bullish/Bearish Diagonals and Verticals • Iron Condors.